Those unfamiliar words jumped out from the opening page of a vermilion leather-bound menu, a reminder that I was no longer in traffic-choked Jakarta but the easygoing Malaysian city of Malacca. Sitting in a rattan cane–backed dining chair, I looked up to see pastel-colored walls decorated with replicas of historical prints and old photographs; wooden fans spun lazily from the high ceiling as the nighttime breeze filtered in through half-open windows. 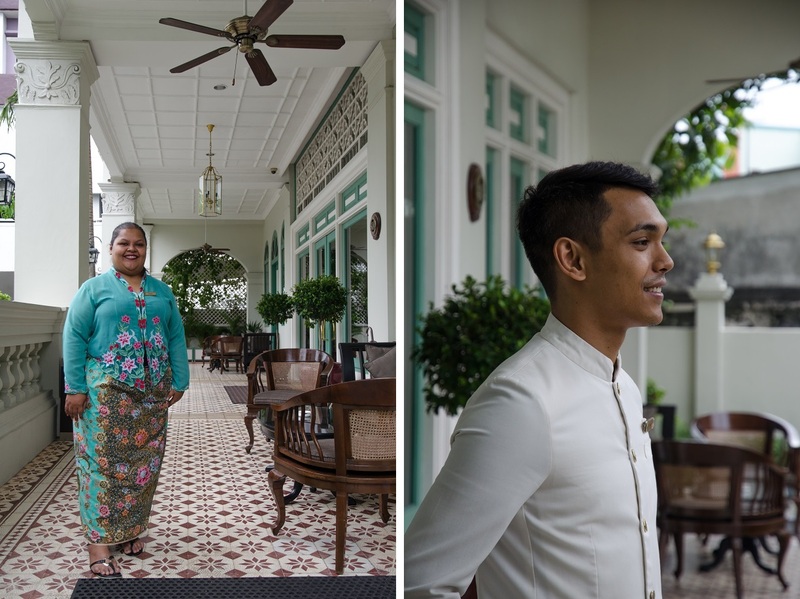 This was Melba at the Mansion, the upstairs restaurant inside a heritage-themed hotel called The Majestic Malacca, and I was about to get a culinary introduction to Kristang culture. I first stumbled across an article on the Kristang people – Malaysia’s smallest ethnic minority – roughly five years ago as Bama and I were researching for our 2015 Spice Odyssey across South and Southeast Asia. Their origins date back to 1511, when the cunning general and empire-builder Afonso de Albuquerque conquered the fabled Malay seaport of Malacca for Portugal. The Kristang are descendants of 16th- and 17th-century Portuguese settlers who intermarried with the local Malay women, a cross-cultural people meant to administer Portugal’s Asian maritime empire. Not for nothing was the name derived from the word cristão, or Christian; they staunchly retained their Roman Catholic traditions and a distinctive creole language, Papiá Kristang, even as Malacca passed into the hands of the Dutch (1641) and then the British (1824) before independence in the decades after World War II. Bama and I had no such luck when we arrived in the summer of 2015. 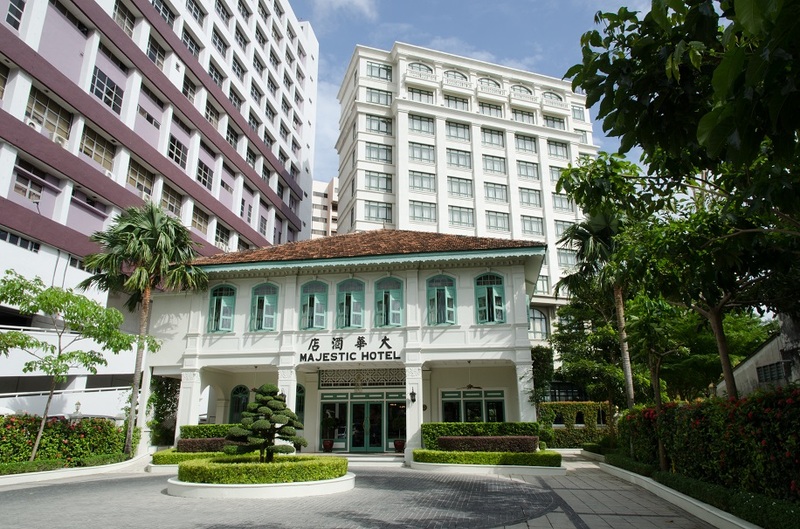 In contrast to the broad representation of the Malay-Chinese community known as the Peranakan or Baba Nyonya, there was not a single museum or restaurant in Malacca’s UNESCO-inscribed historic center devoted to the Kristang. We’d also made the mistake of not heading out into the Portuguese Settlement, a coastal semi-suburban area where most of the local Kristang still live, and unlike Raquel, did not know anyone from the close-knit community. 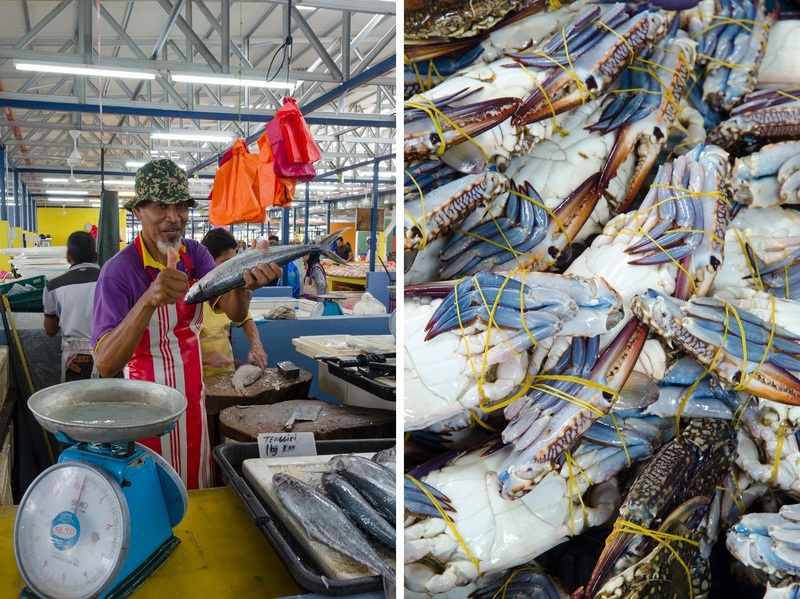 Now, on my second visit to Malacca – this time to write a story for work – I was sitting across the table from Melba Nunis, a locally born Kristang chef who had placed the little-known cuisine in the national spotlight. She had introduced herself as Mel, and her natural warmth and graciousness made me feel as though I’d entered the house of a family friend. I soon learned that the Kristang identity was far more complex than my initial research had suggested. 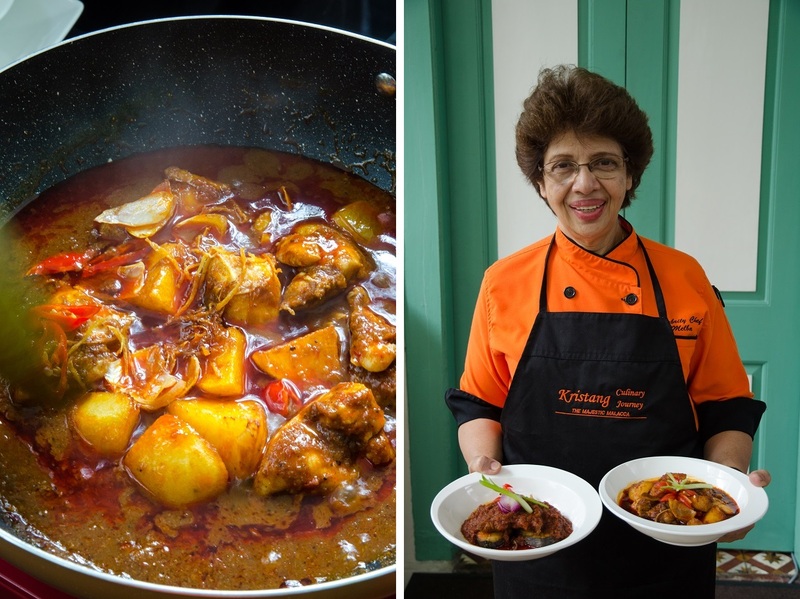 It wasn’t just a syncretic blend of Malay and Portuguese culture; later arrivals from China, India, the Netherlands, and even Britain were added to the mix, taking the eclecticism of Kristang cuisine to another level. As if to drive that point home, Mel recommended a quartet of classic Kristang dishes, two of which revealed deep connections with former Portuguese colonies elsewhere in Asia. The Malaccan specialty of fermented krill paste, or cincalok, was used to great effect in a series of small but thick half-moon omelettes. 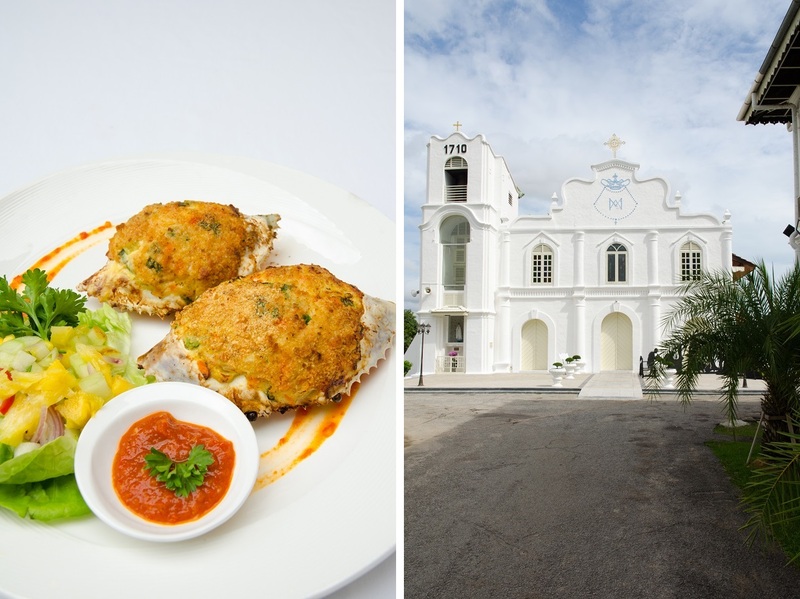 Baked stuffed crab called inchimintu karangezu resembled the casquinhas of Macau, though this version had an unmistakable Southeast Asian flair: the filling comprised freshly picked crabmeat, minced chicken and prawns, and an assortment of diced carrot, spring onion, and jicama. For added flavor and texture it was served with homemade chili sambal and pickled pineapple. Mel’s kari seccu, or slow-cooked beef shin and potatoes in a dry Portuguese curry, was a revelation. 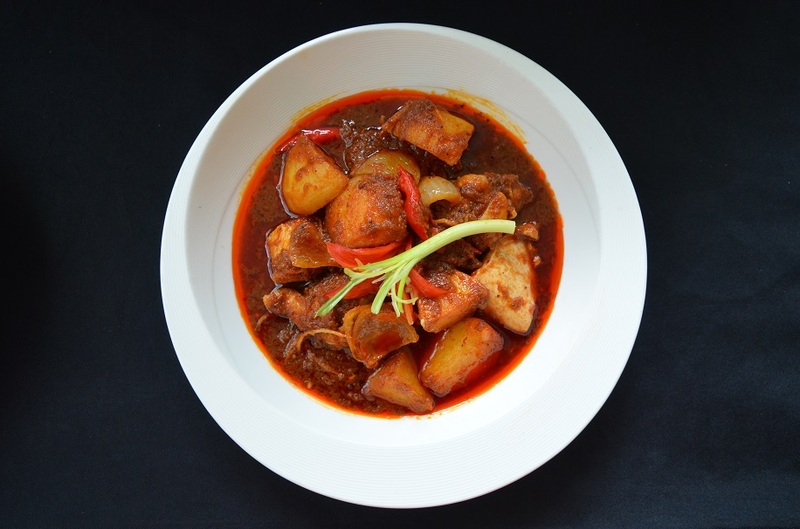 Though the flavor reminded me of Goan Catholic cuisine, one would only have to prod the curry to see that it had also been infused with Southeast Asian ingredients like lemongrass. Meanwhile, the Chinese influence was clearly apparent in soy limang terung – soft, almost buttery halves of fried eggplant in soy sauce laced with equal parts of sugar and lime juice, crowned with thickly chopped red chilies and translucent slices of onion. All told, it was a lip-smacking feast I only just managed to finish. The next day, following a visit to the central market, Mel handed me an apron for a private cooking class. 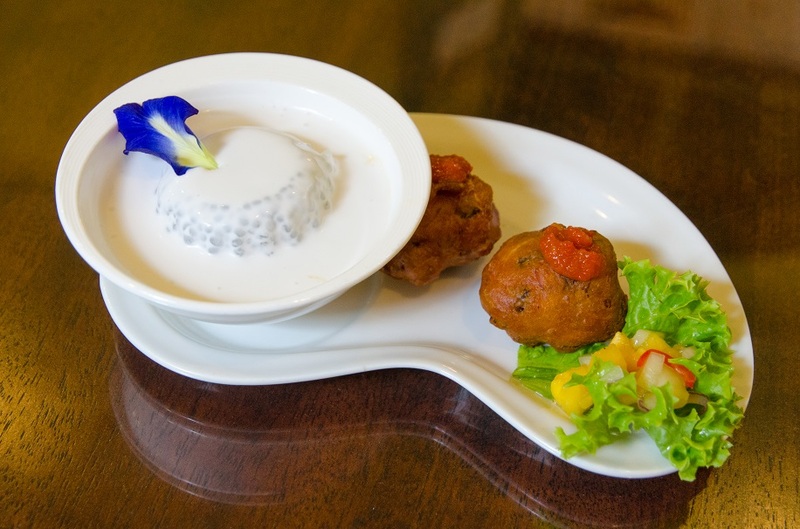 On the menu was kari debal, literally “devil’s curry”, a much-loved Christmas specialty that is emblematic of Kristang cuisine, and one that gets its complexity from a host of fragrant ingredients such as ground mustard seed, galangal, and ginger. 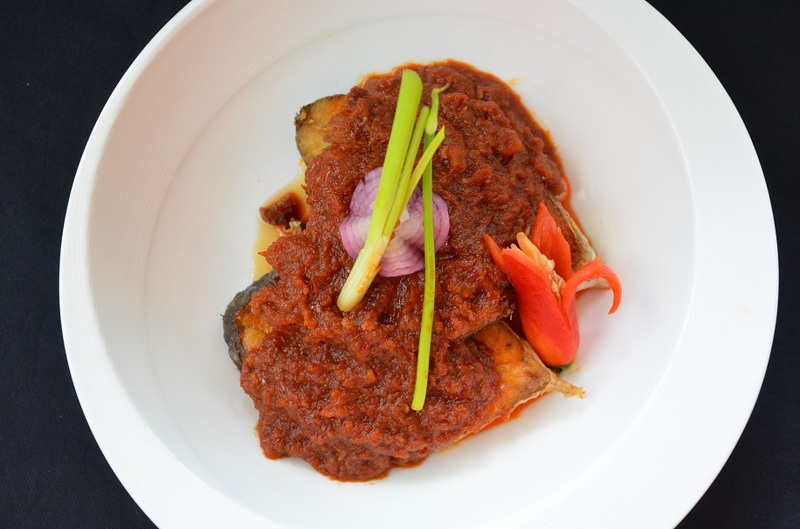 But there was another quintessential Kristang dish that turned out to be my absolute favorite: shallow-fried steaks of Spanish mackerel dressed with sambal binagre. This thick red sauce combined the Portuguese love for vinegar with a touch of sweetness and a piquant Malay spice paste. To make the sambal, drain the dried chilies and place in a food processor with the shallots and candlenuts. Add water (not too much) and blend well, making sure the sambal remains a little coarse for more texture. Wash and clean the fish, then pat dry with a paper towel. Season with turmeric, chili powder, salt and pepper. Heat some oil in a pan over medium heat. Place the fish gently into the hot oil and fry on one side until the skin is crisp before turning over to cook the other side. Remove to a serving plate. Reheat the pan and add more oil as necessary. Add the sambal paste and stir-fry for 2 to 3 minutes until fragrant. Add the water, vinegar, salt, sugar, and dark soy sauce, and simmer over low heat until the sambal is thick. Pour the sambal over the fried fish. Garnish with chopped spring onion and serve, ideally with steamed rice. *A building block of Malaysian and Indonesian spice pastes, candlenut is not easy to find beyond Southeast Asia, especially so in the cooler climes of North America. If candlenut is not available, raw macadamia and other oil-rich nuts such as almonds and cashews are a reasonable substitute. I am suddenly feeling famished after reading your delicious article James. Your food photography is superb and I appreciate your story telling and history sharing along with the recipe. Thank you, Sue! 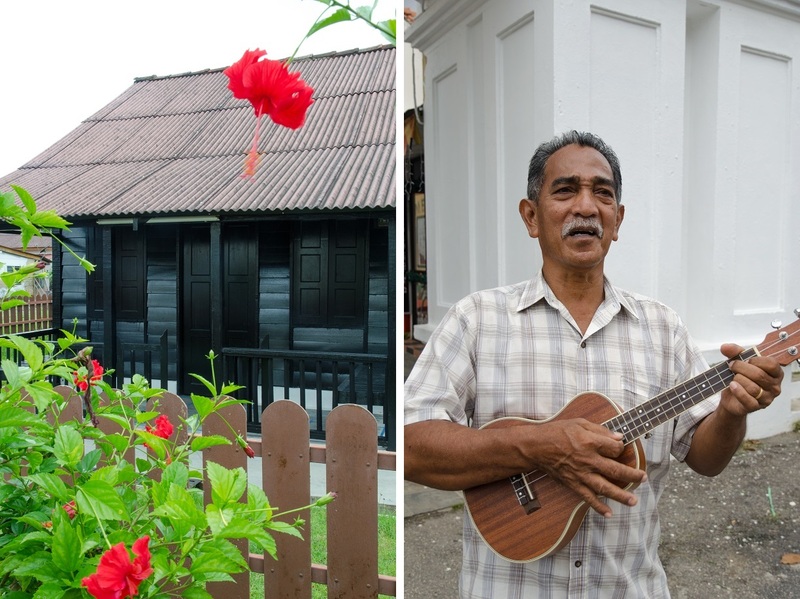 I was very fortunate to go on assignment and immerse myself into such a fascinating (and in many ways little-known) side of Malacca. Mel taught me so much about her culture and cuisine; I can’t wait to go back and try some more of her fabulous Kristang dishes. James, this is so fascinating to read about the Kristang people in Malacca and how they have retained their traditions and language, and how their cuisine evolved. Portuguese, Indian, Chinese, SE Asian..what a delicious meshing of food influences. I have very fond memories of Malacca from many years back but stayed in a super cheap, not so nice hostel. It may be time to go back and stay at the Majestic, or at least eat there. Thanks for the recipe. I haven’t heard of candlenuts but thanks for the substitute. My pleasure, Caroline. It would be a disservice to both Mel and the Kristang in general not to pass on such a wonderful recipe. I’m not sure if candlenuts are available in Vancouver, but one quick Google search suggested that they *might* have it inside 88 Supermarket on Victoria Drive. My worry about using substitutes is that candlenut has a very specific flavor – it smells buttery when cooked and has been described as giving a subtle, slightly soapy aftertaste. Very kind of you to look this up for me James. There are lots of advantages to living in a multicultural city like Vancouver (never ceases to amaze me what I can find at ethnic grocery shops). Probably the most memorable thing you told me from your work trip to Malacca was how Mel eventually pursued her passion, which she now shares with those visiting her beloved hometown. I can’t help but think of my mom who, as you said, is an excellent cook. Some of her friends in fact encouraged her to start her own culinary business after tasting her cooking, and so did my aunt. Maybe you can tell her about Mel when you meet her again for Idul Fitri. As for the food, although I can only imagine how delicious all those dishes must have tasted, at least I was lucky to try one! If only Jakarta’s own ‘Kristang’ community in Kampung Tugu still retained much of their culture, they would have added more color to this already diverse city. And it is such a shame that the culture and traditions of Kampung Tugu have diminished so much. The creole language that used to be spoken there was Kristang’s closest relative, but it practically died out in the 1970s. I wonder if there are any recipes specific to Kampung Tugu that still remain to this day. Mel sounds like a chef who has lived quite a life and does cooking with passion. That baked stuffed crab sounds nothing short of amazing. From the dishes you had at the restaurant, it sounds like the best of South-East Asian ingredients were used and cooked proudly too. You recounted each dish so well – each of them must be so good. I think wherever you go in Asia, friends and family often demonstrate their love through food – making sure their guests and loved ones are well-fed! One thing that amazed me about Mel’s restaurant was the incredible variety of food there was on the menu. And that had just a fraction of the recipes she received from her mother. Judging from my time at the market with her, I could tell that she only chose the freshest ingredients. What a wonderful story…the recipe looks good too. Thank you, Debra. Since Malacca is just 2.5 hours by bus from the airport at Kuala Lumpur, it’s something to look forward to if you ever decide to stop over in Malaysia on your journeys between Italy and Brisbane. The restaurant is quite hidden – there aren’t any signs showing where it is, so when you enter the hotel just look for a wooden staircase behind the reception desk. It’s not too expensive either and if Mel is around you’ll likely get to meet her too. She loves to introduce herself to every guest who comes in. Judging from the previous comments, the baked stuffed crabs seem to be a readers’ favorite! Not being a huge foodie myself, I sometimes skim food-based articles. As usual, though, I got sucked in by the stories behind the food in yours! For me, the fascinating part is the history of cultural intermingling and the personal stories that are evident in the final food product. This one was a great example of both! Much appreciated, Lex! Guess I have a soft spot for food history… it was one of the primary drivers of our six-month trip back in 2015, and though I didn’t get to experience Kristang culture (or try their food) at the time, I’m so glad I got the chance to revisit Malacca for work! Wow, it all looks so delicious. I can’t wait to get back to Malaysia. That’s one of the best things about it – the fabulous food. Hopefully you’ll get to stop by Malacca in the not-too-distant future! I am drooling all over your photos James! Had never heard of the Kristang community before. Every single item of food you have listed here sounds fabulous. I have only ever visited KL and very briefly and my food memories aren’t the greatest. Then again, I am not much of a foodie to begin with. But this post makes me want to explore Malacca purely for its food. Thank you for another superb post and for the recipe. You’re welcome, Madhu! I think you would love Malacca because of its multilayered history and the wealth of associated museums. That said, there is very little trace of the Portuguese presence save a ruined hilltop church and the sole surviving gateway from the A Famosa Fortress – when the Dutch took over in 1641 they razed practically all the city’s Baroque churches and monasteries. The most enduring (and yet the least known) legacy is the Kristang people themselves.